I admit it, I’m a cabbage roll newbie. So I welcomed the challenge of coming up with a vegetarian stuffed cabbage roll recipe, especially one made in a slow cooker. I would learn the ropes of cabbage-roll-making while–hopefully–also cranking out a decent recipe for them! It took a few tries to get it right, but I’m pretty happy with these Slow Cooker Mushroom-Lentil Stuffed Cabbage Rolls. Based off of this recipe from Real Simple, my version swaps out the meat for lentils and mushrooms. I also opted for brown rice over white, and regular green cabbage (you know, the big round heads we’ve all seen) instead of Savoy cabbage. Green cabbage was, for me, easier to find–and sturdy enough to hold up well. Like, I said, I’m new at this cabbage roll business. As it turns out, though, the actual rolling is pretty easy. Just put your filling in the middle of the leaf, and fold the stem-end up by about one-third. Finish rolling. Voila! The occasional roll may suffer a tear or two, but don’t worry — they’ll stay intact in the slow cooker. This recipe is really easy to make, and especially convenient if you go with the store-bought jar of marinara sauce. Yes, you do need to cook the lentils and rice first (trust me, I really wanted to put them in raw, but the recipe just didn’t work that way). But otherwise, it’s a cinch to put together–and definitely a tasty, comforting meal to come home to. Me, I’m officially a cabbage roll convert. And–dare I say–newbie no more! These hearty and satisfying cabbage rolls swap in chopped mushrooms and lentils for the meat. 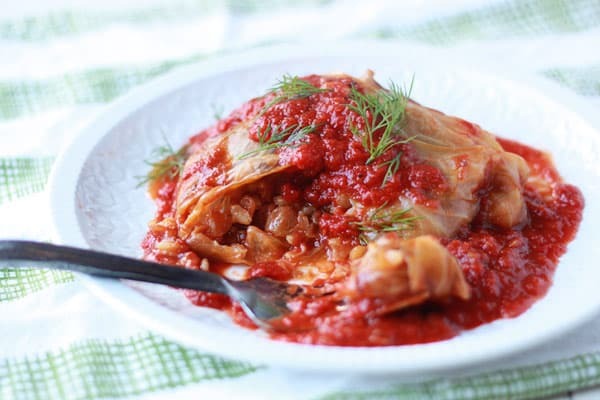 Adapted from Real Simple’s Slow Cooker Pork-Stuffed Cabbage. Bring a large pot of water to a rolling boil. Carefully drop the cabbage into the pot and let it boil for about 5 minutes. Put the cabbage in a colander set over a large bowl to drain and cool slightly. 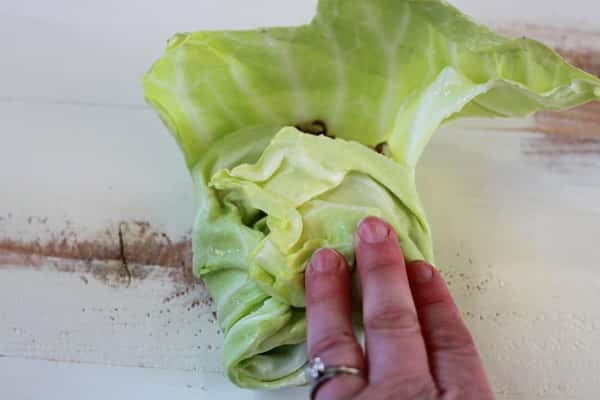 Remove the outermost layers of leaves, until you reach leaves that aren’t pliable. Repeat the boiling and draining process until you have 8 cabbage leaves. Pat the leaves dry with paper towels and set aside. To a medium bowl, add the lentils, rice, onion, mushrooms, pine nuts, raisins, garlic, dill, olive oil, and salt. Stir gently until well-combined. Add the marinara sauce and 1/4 cup water to a 3-quart or larger Crock Pot. Stir to combine. 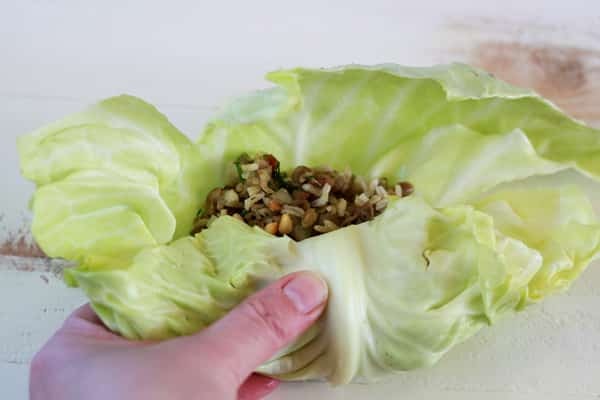 Set a cabbage leaf on a working surface, outer side down, and scoop about 1/2 cup of the mushroom-lentil mixture into the middle. Fold the stem end up about 1/3 of the way, then fold in the sides. Continue rolling semi-tightly until completely rolled up. Lay roll seam-side down on top of the marinara sauce. Repeat with remaining cabbage leaves, piling each into the slow cooker in one or two layers, right on top of one another. Cook on high for 4-5 hours or on low for 8-10 hours. To serve, scoop out a little marinara and spread it on a plate. Carefully remove cabbage rolls one at a time and transfer to the plate. Ladle an additional spoonful or two of the marinara sauce from the slow cooker over the top of each roll and top with a few sprigs of fresh dill, if desired. * To toast the pine nuts, place a medium saute pan over medium heat and add the pine nuts. Cook, stirring frequently, until toasted and just beginning to get fragrant, 4-5 minutes. Watch closely and stir constantly toward the end of the toasting process, as they can burn easily! These rolls look so scrumptious! You made’em look so easy to make, Kare! Thanks for sharing! pinning! These are so easy and delicious. My crockpot was too big so I used a Dutch oven and cooked at 350F for 90 mins and they turned out perfect. I also froze the whole cabbage the night before and defrosted in the fridge before using. Requires a little more planning but then you don’t have to deal with boiling water! 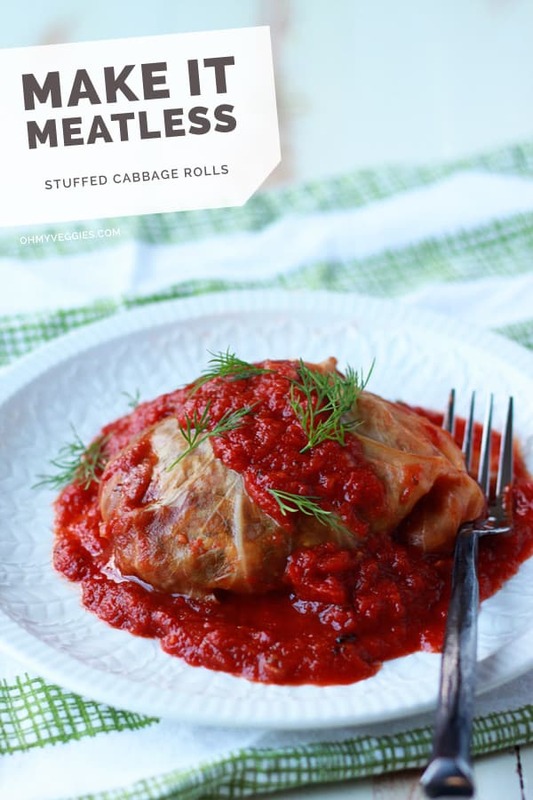 Thanks so much for the flavorful introduction to meatless cabbage rolls. This is a keeper! I love this recipe especially because it looks very easy to make! This looks like a really fun recipe! I shall give this a try one of these days. Thanks for sharing! Yay for losing your cabbage roll V-card! I lost mine last year and I am IN LOVE. My version was totally different than yours though…which just means I’ll HAVE to try this! So many cabbage rolls in my future = WINNING. Growing up Polish I had my share of stuffed cabbage, but this filling sounds fantastic! I still can’t do the cooked cabbage part, but the insides….YUM! I’ll have to share this recipe with my family. These look delicious- but I don’t have a slow cooker. Any ideas on what to do? This is a great recipe! Thanks very much! I wonder if I can use red cabbage instead of green….what do you think? (It’s what I have on hand).